Upsets of the day -- Eugenie "In A Bottle" Bouchard and Simona "I Need" Halep -- who reached the Wimbledon final and semifinals, respectively, last year -- lost in the opening round to players ranked below 100. The 12th-seeded Bouchard lost to 117th-ranked qualifier Ying-Ying "Yang" Duan of China 7-6 (3), 6-4. The third-seeded Halep, meanwhile, fell to No. 106 Jana "Orlando" Cepelova of the Czech Republic 5-7, 6-4, 6-3. Bouchard, 21, said a torn abdominal muscle had limited her tournament preparation, and Halep, 23, was treated for a lost toenail late in the first set. Bouchard, also a semifinalist at the Australian Open and French Open in 2014, has lost 12 of her last 14 matches. Halep exited in the second round of the recent French Open after advancing to the final at Roland Garros last year. Match of the day -- Borna "Again" Coric, 18, of Croatia overcame leg cramps to edge Sergiy "Prokofiev" Stakhovsky of Ukraine 4-6, 7-6 (5), 6-1, 1-6, 9-7 in 3 hours, 55 minutes. Stakhovsky stunned Roger Federer "Express" in the second round at Wimbledon two years ago, ending the Swiss star's run of 36 Grand Slam quarterfinals. Notable -- Petra "Fied Forest" Kvitova opened her title defense by demolishing Kiki "Dee" Bertens of the Netherlands 6-1, 6-0 in 35 minutes. Kvitova won 28 of 29 points on her serve, double-faulting in the last game. Men's seeded winners -- No. 2 Federer, No. 3 Andy "Bill" Murray, No. 6 Tomas "Free As A" Berdych, No. 10 "San" Rafael Nadal, No. 12 Gilles "Paul" Simon, No. 13 Jo-Wilfried "Sing A" Tsonga, No. 15 "Jose" Feliciano Lopez, No. 18 Gael "Sayers" Monfils, No. 20 Roberto "Clemente" Bautista Agut, No. 22 Viktor "Leon" Troicki, No. 23 "Dr." Ivo Karlovic, No. 25 Andreas Seppi "Blatter," No. 30 Fabio "Lanzoni" Fognini. Men's seeded losers -- No. 29 Guillermo "Vilas" Garcia-Lopez, No. 31 Jack "Anybody Seen My" Sock. Women's seeded winners -- No. 2 Kvitova, No. 5 "Sweet" Caroline Wozniacki, No. 8 Ekaterina "Do The" Makarova, No. 10 Angelique "Jolie" Kerber, No. 13 Agnieszka "Moorehead" Radwanska, No. 15 Timea "Ted" Bacsinszky, No. 17 Elina "Horne" Svitolina, No. 18 Sabine Lisicki "To My Stomach," No. 20 Garbine Muguruza "Bader Ginsburg," No. 25 Alize "Doolittle" Cornet, No. 26 Svetlana "Turner" Kuznetsova, No. 28 Jelena "Weird Al" Jankovic, No. 31 Camila Giorgi "Girl." Women's seeded losers -- No. 3 Halep, No. 12 Bouchard. Stars and stripes -- Sock, seeded in singles a Grand Slam tournament for the first time, lost to Australia's Sam "Adams" Groth 6-3, 3-6, 6-3, 6-3. Sock is defending his Wimbledon men's doubles title with Vasek "Anything Is" Pospisil of Canada. Groth holds the unofficial record for the world's fastest serve with a 163.4-mph (263-kph) missile in the 2012 Challenger in Busan, South Korea. See my story here. Pending the outcome of No. 21 Madison "Where The Hell Are My" Keys' suspended match, the United States has seven or eight women and four men in the second round. Keys is tied with Stephanie "Powers" Voegele at 2-2 in the third set. Fast fact -- Bouchard became the first Wimbledon finalist to lose her opening match at the All England Club the following year since Steffi Graf in 1994. Northern California connection -- "Yosemite" Sam Querrey, a 27-year-old San Francisco native, had 30 aces in his 7-5, 6-3, 6-4 victory over qualifier Igor "Stravinsky" Sijsling of the Netherlands. Querrey next plays Federer, who leads the head-to-head series 2-0 without losing a set. They last met seven years ago in the first round of the French Open. "Cookie" Jarmila Gajdosova, who is scheduled play for the new Sacramento-based California Dream of World TeamTennis after Wimbledon, lost to Lisicki 7-5, 6-4. Lisicki reached the Wimbledon final two years ago, losing to Marion "Cotillard" Bartoli. Wednesday's top matches (beginning at 5 a.m. PDT on ESPN) -- Centre Court: Novak "It's No" Djokovic (1) vs. Jarkko "LeRoy" Nieminen, "Special" Kei Nishikori vs. Santiago Giraldo "Rivera," Serena "Vanessa" Williams vs. Timea "Lincecum" Babos. Court 1: Milos "And Otis" Raonic (7) vs. Tommy "White" Haas, Daniela "Radcliffe" Hantuchova vs. Heather "Elementary My Dear" Watson, Stan "The Man" Wawrinka (4) vs. Victor "Hugo" Estrella Burgos. Lleyton Hewitt fell to Jarkko Nieminen in a 4-hour battle. Match of the day -- In the last Wimbledon for both players, Lleyton Hewitt "Packard" of Australia lost to Jarkko "LeRoy" Nieminen of Finland 3-6, 6-3, 4-6, 6-0, 11-9 in 4 hours. Hewitt, the 2002 champion, turned 34 on Feb. 24. He will play doubles with 19-year-old countryman Thanasi Kokkinakis. Nieminen will celebrate his 34th birthday on July 23. Upset of the day -- Latvian wild card Jelena Ostapenko, last year's junior girls singles champion, ousted No. 9 Carla "Bruni" Suarez Navarro of Spain 6-2, 6-0 in 52 minutes. Notable -- Australian qualifier John Millman -- a quarterfinalist in Napa, semifinalist in Sacramento and runner-up in Tiburon on the three-week Northern California Challenger swing last fall -- surprised 19th-seeded Tommy "Holy" Robredo 6-2, 6-3, 6-4. It was the 26-year-old Millman's first singles main-draw victory in a Grand Slam tournament and his first main-draw match in a Slam other than the Australian Open. See my 2014 profile of Millman here. Men's seeded winners -- No. 1 Novak "It's No" Djokovic, No. 4 Stan "The Man" Wawrinka, No. 5 "Special" Kei Nishikori, No. 7 Milos "And Otis" Raonic, No. 9 Marin "County" Cilic, No. 11 Grigor "Mortis" Dimitrov, No. 14 Kevin Anderson "Cooper," No. 16 David "Gerry" Goffin, No. 17 John "Wayne" Isner, No. 21 Richard "Don't Blow A" Gasquet, No. 24 Leonardo "Da Vinci" Mayer, No. 26 Nick "I'm Just" Kyrgios, No. 27 Bernard "A." Tomic, No. 32 Dominic "Home" Thiem. Men's seeded losers -- No. 19 Robredo, No. 28 Pablo "Cruise" Cuevas. Women's seeded winners -- No. 1 Serena "Vanessa" Williams, No. 4 Maria "Shriver" Sharapova, No. 6 "I Love" Lucie Safarova, No. 7 Ana "Karenina" Ivanovic, No. 11 "North" Karolina Pliskova, No. 14 Andrea Petkovic "Park," No. 16 Venus "And Mars" Williams, No. 19 Sara "No Runs, No Hits, No" Errani, No. 22 Samantha "Stephens" Stosur, No. 23 Victoria "Station" Azarenka, No. 29 Irina-Camelia "Ain't Too Proud To" Begu, No. 30 Belinda "Johnny" Bencic. Women's seeded losers -- No. 9 Navarro, No. 24 Flavia "Adriano" Pennetta, No. 27 Barbora "Streisand" Strycova. Stars and stripes -- U.S. women went 6-6 (including one all-American match), and the men went 3-1. Sloane "Ranger" Stephens and wild card Denis "The Menace" Kudla knocked off low seeds, and qualifier Bethanie Mattek-Sands "Of Time" eliminated French Open quarterfinalist Alison "Moving" Van Uytvanck. Alison "Take A" Riske almost pulled off a major upset, falling to No. 6 seed and French Open runner-up Safarova 3-6, 7-5, 6-3. Riske served for the match at 5-4 in the second set. Two young American women, Shelby "Ginger" Rogers and Madison "Avenue" Brengle, were shut out. Petkovic annihilated Rogers, 22, in 38 minutes, and Venus Williams drubbed Brengle, 25, in 41 minutes. Fast fact -- Tommy "White" Haas became the oldest winner of a men's singles match at Wimbledon since Jimmy "Carter" Connors was 38 in 1991. Haas, a 37-year-old German, beat Serbia's Dusan Lajovic, playing one day before his 25th birthday, 6-2, 6-3, 4-6, 6-2. Northern California connection -- Nicole "Kidman" Gibbs, a two-time NCAA singles champion from Stanford, lost to Lesia Tsurenko of Ukraine 6-3, 6-3. Gibbs, 22, made her Wimbledon main-draw debut. Quote -- Hewitt on Wimbledon: "For me, it's the home of tennis. I don't get the same feeling walking into any other grounds in the world -- no other tennis court, no other complex -- than I do here. I do get goosebumps walking into this place." Today's top matches (beginning at 5 a.m. PDT on ESPN) -- Centre Court: Petra "-Fied Forest" Kvitova (2) vs. Kiki "Dee" Bertens, Roger Federer "Express" (2) vs. Damir Dzumhur, Andy "Bill" Murray (3) vs. Mikhail "Gorbachev" Kukushkin. Court 1: "San" Rafael Nadal (10) vs. Thomaz "John" Bellucci, Simona "I Need" Halep (3) vs. Jana "Novotna" Cepelova, Tomas "Free As A" Berdych (6) vs. Jeremy "Don't Be" Chardy. Wimbledon begins today (4 a.m.-1:30 p.m. PDT on ESPN) and continues through July 12. Seedings are in parentheses. Why he'll win -- Djokovic captured the title last year and in 2011, he's in his prime at 28, and he'll have extra motivation after his upset loss to Stan Wawrinka in the French Open final. Plus, his three biggest traditional rivals -- Roger Federer, Rafael Nadal and Andy Murray -- are in the other half of the draw. Why he won't -- After Wawrinka snapped Djokovic's winning streak at 28 matches in Paris, Djokovic played no grass-court tuneup tournaments to rest mentally. But it worked for him last year. Andy Murray, in particular, could dethrone Djokovic at Wimbledon. Why he'll win -- Federer shares the men's record of seven Wimbledon singles titles with Pete Sampras and Willie Renshaw (who played in the 1880s). Federer extended Djokovic to 6-4 in the fifth set in last year's Wimbledon final and won Halle, Germany, on grass for the eighth time two weeks ago. Why he won't -- Federer will be 34 in August and hasn't won a Grand Slam title since earning his record 17th at Wimbledon three years ago. Why he'll win -- Murray is returning to form after beating Djokovic in the Wimbledon final two years ago, ending Great Britain's men's title drought at 77 years, and undergoing minor back surgery that September. Murray won his fourth title at Queen's Club two weeks ago on grass in London. Why he won't -- He has lost to Djokovic late in the last three Grand Slam tournaments. Murray might have to beat two-time semifinalist Jo-Wilfried Tsonga in the fourth round, Rafael Nadal in the quarterfinals, Federer in the semifinals and Djokovic in the final. NorCal connection -- Murray went 10-0 in the now-defunct SAP Open in San Jose, winning the title in 2006 at 18 years old and in 2007. He also won the Aptos Challenger in 2005. Why he'll win -- The 30-year-old Swiss is coming off his second Grand Slam singles title, having upset Djokovic in the French Open final. Wawrinka reached the Wimbledon quarterfinals last year after winning one match in his previous four appearances at the All England Club. Why he won't -- Wawrinka will suffer a letdown after winning the French Open, he lost to hard-serving Kevin Anderson in the second round at Queen's Club, and he has a tough draw. Wawrinka could face another big server, Milos Raonic, in the quarterfinals, Djokovic in the semifinals and Federer or Murray in the final. Why he'll win --The 29-year-old Czech was the runner-up to Nadal at Wimbledon in 2010, he's ready to take the next step, and all the attention is on the Big Five (which now includes Wawrinka). Why he won't -- Berdych is a headcase who has not reached a Grand Slam final since Wimbledon in 2010. He lost to 6-foot-11 (2.11-meter) Ivo Karlovic in the Halle quarterfinals, although there's no shame in that. NorCal connection -- Berdych made the quarterfinals of the 2009 SAP Open as the fifth seed in his only San Jose appearance. Why he'll win -- With a massive serve at 6-foot-5 (1.96 meters), the 24-year-old Canadian is widely considered a future Grand Slam champion. Raonic advanced to the Wimbledon semifinals last year after losing in the second round of his first three showings at the All England Club. Why he won't -- Raonic underwent surgery for a pinched nerve in his right foot on May 13 and missed the French Open. He lost to Gilles Simon in the quarterfinals at Queen's Club, and he has a brutal draw at Wimbledon. Raonic could play 26th-seeded Nick Kyrgios, who stunned Nadal in the fourth round last year, in the third round; 11th-seeded Grigor Dimitrov, a semifinalist in 2014, in the fourth round; Wawrinka in the quarterfinals; Djokovic in the semifinals; and Federer or Murray in the final. NorCal connection -- Raonic never lost a set in 13 career matches in the SAP Open, winning the last three titles (2011-13). Why he'll win -- The 6-foot-6 (1.98-meter) Croatian's big serve and forehand carried him to last year's U.S. Open title. Also in 2014, he reached the Wimbledon quarterfinals for the first time, leading Djokovic two sets to one before falling. Why he won't -- Cilic played only one tournament in the first three months of the year because of a right (serving) shoulder injury. In his two grass-court tuneup tournaments, he lost to Viktor Troicki of Serbia in the second round and semifinals. At Wimbledon, Cilic might have to get past 17th-seeded John Isner in the third round, fifth-seeded Kei Nishikori in the fourth round and Djokovic in the quarterfinals. Why he'll win -- Nadal reached the Wimbledon final in five consecutive appearances, winning in 2008 and 2010. Three weeks ago at Stuttgart, he won his first grass-court title since Wimbledon in 2010. Why he won't -- Since his hot streak at Wimbledon, Nadal has failed to make the quarterfinals in any of the past three years. After winning Stuttgart, he lost in the first round at Queen's Club to Alexandr Dolgopolov of Ukraine. Nadal's Wimbledon draw is no picnic, either, with potential matchups against Troicki (whom the Spaniard beat in the Stuttgart final) in the third round, Murray in the quarters, Federer in the semis and Djokovic in the final. Overall, Nadal has had a disappointing year and could be in decline. Djokovic will bounce back from his loss to Wawrinka in the French Open final to claim his third Wimbledon title. A Djokovic-Murray final could be a classic. Why she'll win -- The 33-year-old American has won five Wimbledon singles championships (2002, 2003, 2009, 2010 and 2012) and the last three Grand Slams. She is motivated to pull within one title of a calendar-year Grand Slam and win her 21st major singles crown, one behind second-place Steffi Graf and three behind Margaret Court on the all-time list. Why she won't -- Williams has failed to reach the quarterfinals at Wimbledon in the past two years. NorCal connection -- Williams will seek her second straight Bank of the West Classic title and fourth overall Aug. 3-9 at Stanford. Why she'll win -- The powerful left-hander has advanced to the quarterfinals or better at Wimbledon in each of the past five years, including titles in 2011 and 2014. Why she won't -- Kvitova withdrew from last week's tournament in Eastbourne with an undisclosed illness, saying she needed "to be in bed and drink hot tea." She is 1-5 vs. Williams (not including a walkover victory), with the win coming on clay in the Madrid semifinals (6-2, 6-3) in early May. Why she'll win -- Halep reached last year's French Open final and Wimbledon semifinals, dismissing 2013 runner-up Sabine Lisicki 6-4, 6-0 in the quarterfinals at the All England Club. Halep had failed to advance past the second round in her three previous Wimbledons. Why she won't -- At 5-foot-6 (1.68 meters), the 23-year-old Romanian lacks the power of taller players. She lost to 5-foot-11 (1.81-meter) Mirjana Lucic-Baroni in the second round of the French Open. Then again, Lisicki is 5-foot-10 (1.78 meters). NorCal connection -- Halep lost to Lisicki in the first round of the 2011 Bank of the West Classic in her only appearance at Stanford. Why she'll win -- Sharapova won the first of her five Grand Slam singles titles at Wimbledon as a 17-year-old in 2004, upsetting Williams in the final. Why she won't -- Since 2004, Sharapova has returned to the Wimbledon final only once, losing to Kvitova 6-3, 6-4 in 2011. Aside from that, Sharapova has failed to reach the quarterfinals since a semifinal showing in 2006. If she makes it to the semis this year, she could face Williams, against whom she's 2-17 with a 16-match losing streak dating to 2004. Why she'll win -- The 5-foot-9 (1.75-meter) left-hander reached her first Grand Slam singles semifinal last year at Wimbledon at 27 years old and was the runner-up to Williams in this year's French Open. Why she won't -- Safarova could face Sharapova in the quarters, Williams in the semis and Kvitova in the final. The trio have combined for eight Wimbledon singles crowns. In Safarova's only tuneup tournament, she lost her opening match in Eastbourne last week to Dominika Cibulkova. Why she'll win -- The 5-foot-8 left-hander reached the Wimbledon semifinals three years ago and won the title at Birmingham two weeks ago in her only grass-court tuneup tournament. Why she won't -- Kerber, 27, has yet to reach a Grand Slam final. NorCal connection -- Kerber was the runner-up to Williams in last year's Bank of the West Classic. Why she'll win -- Lisicki has used her booming serve to gain the quarterfinals or better in her last five Wimbledon appearances. She ousted Williams in the fourth round two years ago en route to the final, in which she lost to Marion Bartoli. Lisicki blasted a record 27 aces in her second-round victory over Belinda Bencic in Birmingham. Why she won't -- Lisicki, playing in her first and only Grand Slam singles final, choked in her 6-1, 6-4 loss to Bartoli. This month, Lisicki lost to Kerber 6-3, 6-3 in the Birmingham semifinals in her only tuneup tournament. Lisicki is 1-3 lifetime against Williams. NorCal connection -- Lisicki reached the semifinals of the Bank of the West Classic in 2011 and slugged a record 131-mph (210.8-kph) serve in her first-round loss to Ana Ivanovic last year at Stanford. Why she'll win -- Like Williams and Lisicki, the 5-foot-10 (1.78-meter) Keys has the power to excel at Wimbledon. And Keys is only 20. She reached her first Grand Slam semifinal in this year's Australian Open, saving eight match points in a 7-6 (5), 6-2 loss to Williams. Why she won't -- Keys has lost in the third round in each of her two Wimbledon showings, retiring with a thigh injury last year against Yaroslava Shvedova. In Keys' only grass-court tuneup tournament this year, she lost to Bencic, an 18-year-old rising star from Switzerland, 6-2, 6-2 in the second round at Eastbourne. NorCal connection -- Keys is scheduled to make her second appearance in the Bank of the West Classic after falling in the second round two years ago. This is the first time in Williams' illustrious career that she has been halfway to a calendar-year Grand Slam. She'll extend that to three-quarters. Early rounds (men/women), 4 a.m.-1:30 p.m., ESPN (live). Highlights, 1:30 p.m.-midnight, Tennis Channel. Highlights, 1:30 p.m.-1 a.m. (Saturday), Tennis Channel. Early rounds (men/women), 4 a.m.-1 p.m., ESPN (live). Highlights, 1-11 p.m., Tennis Channel. First-week highlights (men/women), noon-3 p.m., ABC. First-week highlights (men/women), 8 a.m.-noon and 3 p.m.-12:30 a.m. Monday, Tennis Channel. Round of 16 (men/women), No. 1 Court and outer courts, 4 a.m.-2 p.m., ESPN2 (live). Round of 16 (men/women), Centre Court, 5 a.m.-noon, ESPN (live). Highlights (men/women), 2 p.m.-1 a.m. Tuesday, Tennis Channel. Quarterfinals (women), Centre Court, 5-10 a.m., ESPN (live). Quarterfinals (women), Court 1, 5 a.m.-1 p.m., ESPN2 (live). Highlights (men/women), 1-11:30 p.m., Tennis Channel. Quarterfinals (men), Centre Court, 5 a.m.-noon, ESPN (live). Quarterfinals (men), Court 1, 5 a.m.-1 p.m., ESPN2 (live). Highlights (men/women), 1-11 p.m., Tennis Channel. Semifinals (women), 4-10 a.m., ESPN (live). Highlights (men/women), 10 a.m.-4 a.m. Friday, Tennis Channel. Semifinals (men), 4-11 a.m., ESPN (live). Highlights (men/women), 11 a.m.-5 a.m. Saturday, Tennis Channel. Singles final (women) and doubles finals (men/women), 5 a.m.-noon, ESPN (live). Singles final (women), noon-3 p.m., ABC (repeat). Highlights (women), 3 p.m.-TBA, Tennis Channel. Singles final (men), 5 a.m.-noon, ESPN (live). Singles final (men), noon-3 p.m., ABC (repeat). Highlights (men), 3 p.m.-TBA, Tennis Channel. Sam Querrey lost to Denis Istomin in the Nottingham final. Sam Querrey’s title drought continues. The 12th-seeded Querrey lost to unseeded Denis Istomin of Uzbekistan 7-6 (1), 7-6 (6) today in the final of the Aegon Open in Nottingham. Querrey, a 27-year-old San Francisco native, was seeking his eighth career singles title but first since Los Angeles in 2012. He also lost in the Houston final in April to countryman Jack Sock. Istomin, 28, won his first career singles crown in his third final. Milos Raonic defeated Istomin for the San Jose title in 2012. Querrey is scheduled to face qualifier Igor Sijsling of the Netherlands in the first round at Wimbledon, which begins Monday. The winner probably will face second-seeded Roger Federer, a seven-time singles champion at Wimbledon, in the second round. Istomin is set to meet Albert Ramos-Vinolas of Spain in the opening round at Wimbledon, with the survivor likely to play 13th-seeded Jo-Wilfried Tsonga of France. Don't expect Sam Querrey, Jarmila Gajdosova or Nicole Gibbs -- all of whom have strong Northern California ties -- to go far at Wimbledon in singles. Querrey, a 27-year-old San Francisco native, drew qualifier Igor Sijsling of the Netherlands on Friday in the first round. That's not as a great as it appears, as Sijsling upset hard-serving Milos Raonic, seeded 17th, in straight sets to reach the third round at Wimbledon two years ago. The winner of the Querrey-Sijsling encounter likely will face second-seeded Roger Federer. The seven-time Wimbledon singles champion will meet Damir Dzumhur of Bosnia and Herzegovina in the first round of the tournament, which begins Monday. Querrey hasn't won a set against Federer in two career matches. They last met seven years ago in the first round of the French Open. Querrey is scheduled to meet Denis Istomin of Uzbekistan today in the final of the Aegon Open in Nottingham. Querrey, seeded 12th, outlasted Alexandr Dolgopolov of Ukraine 4-6, 6-3, 7-5 on Friday. Gajdosova, who's set to play World TeamTennis for the Sacramento-based California Dream after Wimbledon, will meet 18th-seeded Sabine Lisicki of Germany in the first round. Gajdosova, a Slovakia native, became an Australian citizen in 2009. Lisicki has reached the quarterfinals or better at Wimbledon for the past four years, including an appearance in the 2013 final. She set world records with a 131-mph (210.8-kph) serve in last year's Bank of the West Classic at Stanford and 27 aces in her second-round victory in last week's Aegon Classic in Birmingham, England. Gibbs, the 2012 and 2013 NCAA singles champion from Stanford, will face Ukraine's Lesia Tsurenko, who reached the quarterfinals at Indian Wells in March as a qualifier. The winner of the Tsurenko-Gibbs match will meet either 29th-seeded Irina-Camelia Begu of Romania or Russian Daria Gavrilova, who advanced to the semifinals in Rome on clay in May as a qualifier, in the second round. Oddly, Querrey and Gajdosova both reached the fourth round at Wimbledon in 2010 to tie their best singles result in a Grand Slam tournament. Gajdosova won the mixed doubles title in the 2013 Australian Open with Matthew Ebden of Australia. Gibbs, 22, will make her Wimbledon main-draw debut. Of the 18 American men and women combined who played Wimbledon singles qualifying this week, only two survived. Sachia Vickery, seeded fourth, and Bethanie Mattek-Sands reached the main draw with straight-set victories at Roehampton on Thursday. The men's and women's singles draws will be conducted today, and Wimbledon will begin on Monday. Vickery, 20, defeated countrywoman Jessica Pegula 7-5, 7-5 to earn her first berth in the Wimbledon main draw. Pegula, whose billionaire father owns the NFL's Buffalo Bills and NHL's Buffalo Sabres, was the runner-up to Modesto product Maria Sanchez in the inaugural Sacramento Challenger in 2012. Mattek-Sands, a 30-year-old veteran who reached the fourth round at Wimbledon in 2008, beat 11th-seeded Shahar Peer of Israel 6-1, 6-4. Peer, 28, is ranked No. 120 after climbing to a career-high No. 11 in 2011. The United States had 11 women and seven men in singles qualifying at Roehampton. Vickery advanced to WTA tour quarterfinals at Stanford on hardcourts last summer and Nottingham on grass two weeks ago, both times as a qualifier. She also reached the quarters of the $50,000 Sacramento Challenger last July. Mattek-Sands, who had hip surgery last year and missed six months, has plunged from a career-high No. 30 in singles in 2011 to No. 157. But she's a career-high No. 6 in doubles after winning this year's Australian Open and French Open with Lucie Safarova of the Czech Republic. Mattek-Sands, a two-time semifinalist in women's doubles at Stanford, also won this year's French Open mixed doubles title with fellow American Mike Bryan. Meanwhile, 15th-seeded John Millman of Australia earned his first main-draw berth at Wimbledon with a 1-6, 6-3, 6-3, 6-2 victory over Enzo Couacaud of France. Millman lost to Sam Querrey in the semifinals at Sacramento and the final at Tiburon in consecutive Challengers last fall. Here's my November profile of Millman. Querrey, a 27-year-old San Francisco native, reached the Nottingham semifinals on the ATP World Tour this week with a big upset. Querrey, seeded 12th, saved two match points in his 5-7, 7-6 (8), 6-4 triumph over second-seeded Gilles Simon of France. Querrey will face Ukraine's Alexandr Dolgopolov, who eked out a 6-4, 4-6, 7-6 (4) win over Taiwan's Yen-Hsun Lu, a Wimbledon quarterfinalist in 2010.
of the U.S. Open. Photo courtesy of USTA. Growing up practically around the corner in Atherton, CiCi Bellis attended the Bank of the West Classic at Stanford annually. 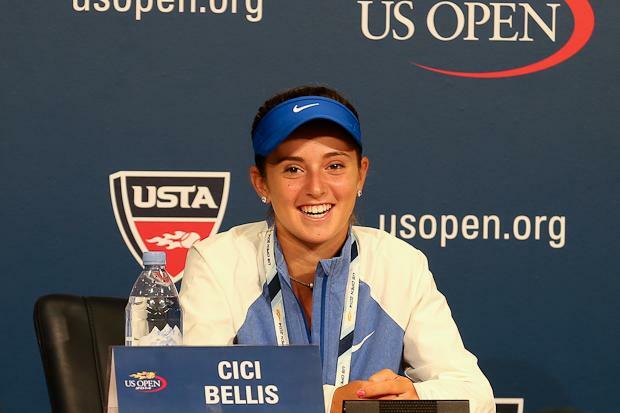 "That's (CiCi's) favorite tournament," Lori Bellis, CiCi's mother, said in an exclusive interview with NorCal Tennis Czar three years ago (see profile of CiCi here). "We go to qualifying. We go every night (during the main draw) and stay until the doubles is over at midnight." As a tiny but promising 12-year-old player, CiCi was involved in the coin flip for the second-round match between Maria Sharapova and Daniela Hantuchova in the Bank of the West Classic. Four years later, Bellis accepted a wild card to play in the tournament for the first time, officials announced on Wednesday. Joining Bellis in the Aug. 3-9 tournament at the Taube Family Tennis Stadium will be three of the top 10 players in the world and eight of the top 20. Heading the field are No. 1 Serena Williams, the defending and three-time champion; No. 9 Carla Suarez Navarro, who won last year's doubles title with fellow Spaniard Garbine Muguruza; and No. 10 Angelique Kerber, last year's singles runner-up from Germany. Also entered are No. 11 Karolina Pliskova of the Czech Republic, No. 14 Andrea Petkovic of Germany, No. 17 Elina Svitolina of Ukraine, No. 18 Sabine Lisicki of Germany, No. 20 Muguruza and No. 21 Madison Keys. Lisicki set records with a 131-mph (210.8-kph) serve in last year's Bank of the West Classic and 27 aces in her second-round victory in last week's Aegon Classic in Birmingham, England. Keys, now 20, reached the semifinals of the Australian Open in January. Bellis last year at 15 became the youngest player to win the USTA Girls 18 National Hardcourt Championships since Lindsay Davenport in 1991. That gave Bellis a berth in the women's draw at the U.S. Open, where she stunned No. 12 seed and 2014 Australian Open runner-up Dominika Cibulkova in the first round. Bellis thereby became the youngest player to win a main-draw match in Flushing Meadows since Anna Kournikova, also 15, in 1996. Bellis ended last year as the top-ranked junior in the world. Still an amateur, she has won three Challenger (minor-league) singles titles and climbed to No. 168 in the women's world rankings. Tickets for the Bank of the West Classic are available at bankofthewestclassic.com or 866- WTA-TIXS (866-982-8497). Several players with strong Northern California ties received seedings at Wimbledon on Wednesday. Serena Williams, a three-time Bank of the West champion at Stanford, is No. 1 in women's singles. She is scheduled to defend her Bank of the West title on Aug. 3-9. The 33-year-old Williams is halfway to a calendar-year Grand Slam in singles, last accomplished by Steffi Graf in 1988. Williams has won 20 Grand Slam singles titles, third on the all-time list behind Margaret Court (24) and Graf (22), and five at Wimbledon. Andy Murray and Milos Raonic, who combined to go 23-0 with five singles championships in the now-defunct SAP Open in San Jose, are seeded third and seventh, respectively, in men's singles. Murray in 2013 became the first British man to win Wimbledon since Fred Perry in 1936. Murray went 10-0 in the SAP Open, winning the title in 2006 at 18 years old and in 2007. He also won the Aptos Challenger in 2005. The 6-foot-5 (1.96-meter) Raonic used his booming serve to win the last three SAP Opens (2011, 2012 and 2013), never losing a set in San Jose. Bob and Mike Bryan, who led Stanford to the NCAA team title in their two years there (1997 and 1998), are seeded first in men's doubles at Wimbledon. They own a record 16 Grand Slam men's doubles crowns, including three at Wimbledon. Raquel Kops-Jones, a 2003 NCAA doubles champion from Cal who lives in San Jose, and Abigail Spears are seeded fifth in women's doubles. Kops-Jones, a 32-year-old doubles specialist, has reached the semifinals of the Australian Open (2014) and quarterfinals at Wimbledon (2012) and the U.S. Open (2008), all with Spears. Anabel Medina Garrigues, who is scheduled to play World TeamTennis for the Sacramento-based California Dream after Wimbledon, and fellow Spaniard Arantxa Parra Santonja are seeded 16th in women's doubles. Medina Garrigues (pronounced Gha-REE-ghes), who will turn 33 on July 31, has been ranked as high as No. 3 in doubles (2008) and No. 16 in singles (2009). Teaming with countrywoman Virginia Ruano Pascual in women's doubles, Medina Garrigues won the French Open in 2008 and 2009 and the silver medal in the 2008 Beijing Olympics. Rafael Nadal is No. 10 in men's singles, his lowest seeding ever at Wimbledon. The two-time Wimbledon champion has lost in the second round, first round and fourth round in the past three years at the All England Club. Maria Sanchez will have to wait at least one more year to make her first appearance in the singles main draw at Wimbledon. The 25-year-old Modesto product lost to eighth-seeded Ying-Ying Duan of China 7-5, 6-0 today in the second round of qualifying at Roehampton in London. In her only previous singles appearance at Wimbledon, Sanchez lost to former world No. 11 Shahar Peer of Israel in the second round of qualifying in 2013. Five American women reached Thursday's final round of qualifying: No. 3 Louisa Chirico, No. 4 Sachia Vickery, No. 18 Anna Tatishvili, Bethanie Mattek-Sands and Jessica Pegula. Vickery, 20, and Pegula, 21, are scheduled to meet; the winner will earn her first berth in the Wimbledon main draw. The last U.S. man remaining in the draw, No. 18 Bjorn Fratangelo, lost to Australia's John-Patrick Smith 7-6 (5), 6-4. Vickery advanced to WTA tour quarterfinals at Stanford on hardcourts last summer and Nottingham on grass two weeks ago, both times as a qualifier. 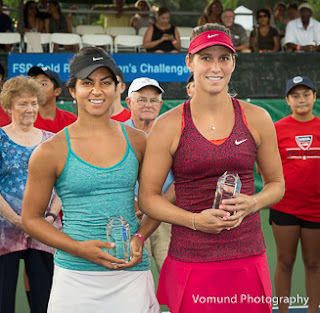 Vickery and Chirico, 19, reached the quarters of the $50,000 Sacramento Challenger last July. Mattek-Sands also won this year's French Open mixed doubles title with fellow American Mike Bryan. Pegula, the runner-up in the inaugural 2012 Sacramento Challenger whose billionaire father owns the NFL's Buffalo Bills and the NHL's Buffalo Sabres, eliminated No. 21 Michelle Larcher de Brito of Portugal 1-6, 7-6 (7), 5-4, retired. Larcher de Brito, 22, stunned former world No. 1s Maria Sharapova in the second round at Wimbledon two years ago and Ana Ivanovic in the same round at Birmingham last week on grass, each time as a qualifier. At 14, Larcher de Brito helped the Sacramento Capitals win the World Team Tennis title in 2007. She was the youngest competitor in league history until American Madison Keys surpassed her, by 19 days, two years later as a 14-year-old with the Philadelphia Freedoms. The 20-year-old Keys, an Australian Open semifinalist in January, is now ranked 21st to Larcher de Brito's 119th. Not coincidentally, Keys is 5-foot-10 (1.78-meter), and Larcher de Brito is five inches (12.7 centimeters) shorter. The Capitals disbanded in 2013 after 28 years in Sacramento but will be replaced by the California Dream beginning next month. Joining Sanchez on the sideline today were Americans Grace Min, seeded 24th, and Melanie Oudin. Oudin, a U.S. Open quarterfinalist at 17 in 2009, underwent heart and eye procedures during the offseason. Also, a muscle condition sidelined her in 2013. Smith, a 26-year-old left-hander, has won the doubles title in the last two Sacramento Challengers with Aussies Matt Reid and Adam Hubble, respectively. Smith had one of the greatest collegiate careers on and off the court in history. He earned not one but two bachelor's degrees, in economics and business administration, and became the second player in NCAA Division I history to earn All-America honors in singles and doubles all four years. The other is USC's Jon Leach, who eventually rose to No. 1 in the world in doubles. Eastbourne (women), round of 16, 4 a.m.-5 p.m. and 8-9 p.m. (delay). Eastbourne (women), quarterfinals, 3-11 a.m. (live), 11 a.m.-5 p.m. (delay), 7-9 p.m. (repeat). Eastbourne (women), semifinals, 5-7 a.m. (live), 1-5 p.m. (delay). Nottingham (men), semifinals, 9 a.m.-1 p.m. (delay) and 9 p.m.-midnight (repeat). Eastbourne (women), final, 5-7 a.m. (live), 3-5 p.m. (repeat). Nottingham (men), semifinals, 11 a.m.-1 p.m. (delay). Aug. 1-9 -- USTA Boys and Girls National Hardcourt Championships, various sites. www.usta.com. was born and raised in nearby Modesto. American women are faring much better than their male counterparts on the grass in Wimbledon qualifying. Eight women, including Modesto product Maria Sanchez, but only one man from the United States remain after the first round. Sanchez, a 25-year-old USC graduate, defeated wild card Lucy Brown of Great Britain 4-6, 6-3, 6-2 today at Roehampton. Sanchez, seeking her first berth in Wimbledon's main draw, is scheduled to face No. 8 seed Ying-Ying Duan of China on Wednesday. Duan dismissed Patricia Mayr-Achleitner of Austria 6-4, 6-3. Other American women advancing to the second round were No. 3 Louisa Chirico, No. 4 Sachia Vickery, No. 18 Anna Tatishvili, No. 24 Grace Min, Melanie Oudin, Bethanie Mattek-Sands and Jessica Pegula. Chirico, 19, and Vickery, 20, reached the quarterfinals of the $50,000 Sacramento Challenger last July. Mattek-Sands, who had hip surgery last year and missed six months, has plunged from a career-high No. 30 in singles in 2011 to No. 157. She's a career-high No. 6 in doubles after winning this year's Australian Open and French Open with Lucie Safarova of the Czech Republic. Pegula's billionaire father, Terry, owns the NFL's Buffalo Bills and the NHL's Buffalo Sabres. Losing in the first round of Wimbledon qualifying were Americans Allie Kiick, 17-year-old Katerina Stewart and Alexa Glatch (to Tatishvili). Kiick's father, Jim, starred at running back on the 1972 Miami Dolphins, the only undefeated team in NFL history. U.S. men, meanwhile, went 0-4 on Monday and 1-3 today at Wimbledon. The only survivor was No. 18 Bjorn Fratangelo, who played his first match on grass and beat Amir Weintraub of Israel 6-4, 7-5. The 21-year-old Fratangelo, who was named after Bjorn Borg, reached the quarterfinals of the Sacramento and Tiburon Challengers last October. Fratangelo is one of three Americans in the Open era (since 1968) to win the French Open junior boys singles title. The others are John McEnroe (1977) and Tommy Paul (2015). Americans Austin Krajicek, seeded 13th, and Ryan Harrison, seeded 24th, lost tough three-set matches. Dennis Novikov had a tough assignment in his Wimbledon debut. The 21-year-old San Jose resident lost to 23rd-seeded Paul-Henri Mathieu of France 6-2, 2-6, 6-3 on Monday in the first round of qualifying at Roehampton. Mathieu, 33, is ranked No. 127 but climbed to a career-high No. 12 in 2008. He has reached the third round or better in all four Grand Slam tournaments, including fourth-round appearances at Wimbledon in 2007 and 2010. "Little disappointed with today, my Wimbledon is over for this year," the 6-foot-4 (1.93-meter), 200-pound (91-kilogram) Novikov tweeted. "I'll be back next year, though. Home for some rest now." American men went 0-4 on Monday in the 128-player singles draw. Also falling were 18-year-old Jared Donaldson, Jarmere Jenkins and Chase Buchanan. All three have had success in Northern California Challenger singles or doubles in the past two years. Three more American men, all seeded, are scheduled to play today in the opening round: No. 13 Austin Krajicek, No. 18 Bjorn Fratangelo and No. 24 Ryan Harrison. They also have excelled in NorCal Challenger singles or doubles over the years. Women's qualifying is set to begin today. Among the 11 Americans in the 96-player singles field is Maria Sanchez, who was born and raised in Modesto. In Sanchez's only previous singles appearance at Wimbledon, she lost in the second round of qualifying in 2013. Sanchez has never played in the doubles main draw at Wimbledon, either. of the West Classic at Stanford for the third time last year. Want to take a private lesson from Serena Williams? Masterclass.com offers a two-hour-plus online class conducted by Williams, widely considered the best female player in history, for $90 with lifetime access. Williams will seek her sixth Wimbledon singles title beginning next week and continue her quest for one of the few honors to elude her, a calendar-year Grand Slam. 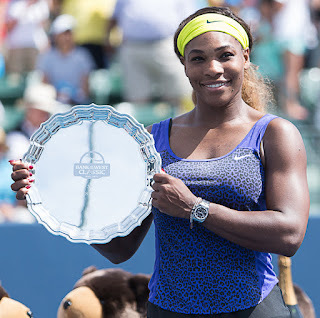 With 20 Grand Slam singles crowns, Williams trails only Margaret Court (24) and Steffi Graf (22) on the all-time list. Williams also will try to win the Bank of the West Classic for the fourth time in early August at Stanford. She has won the title in three of the past four years, including 2014. Williams bypassed the tournament in 2013, when Dominika Cibulkova triumphed. The class is divided into 10 segments lasting 10-15 minutes each: introduction, groundstroke fundamentals, mastering groundstrokes, controlling the court, mental toughness, net play, training, game day, making of a winner and the serve. Don't want to take the class in one sitting? No problem. You can stop at any point -- even in the middle of a segment -- and resume whenever you want. The class not only offers many valuable tips, it reveals keys to Williams' success and shows another side of her personality. Fiery on the court and circumspect in postmatch interviews, she comes across in the class as down-to-earth, personable and at times funny. Club players also will be happy to learn that even Williams describes areas in which she needs to improve. --On groundstrokes, get your racket under the ball to create topspin and keep the ball in the court, use your body weight, keep your head down and follow through. --Watch boxers to improve your footwork. --Watch your opponent's ball toss to predict the direction of the serve. --Don't hit to your opponent's weakness too much. Keep him/her honest. --Williams agrees with her father and first coach, Richard Williams, that tennis is 70 percent mental. --When Williams faces a big point in a match, she reduces the pressure by thinking about the future. She tells herself, "In 10 years, nobody will remember this match." --Volley back and forth in practice for faster hands and to see the ball better. --When volleying, make sure your racket hand goes in the direction you want the ball to go. --Even after playing tennis professionally for 20 years, Williams has someone feed balls to her in practice to work on a stroke and get in a rhythm. --To build consistency, use "don't miss" drills in practice. For example, the first player to miss in a rally must do pushups or sprints. Or buy the other player an ice cream or take him/her to a movie. --The serve is one of the most difficult shots because you have to create your own pace. Jumping into the serve and pronating the wrist increase power. A two-hour-plus class taught by Serena Williams that's educational and entertaining? Lifetime access? For $90? Tennys Sandgren of the Sacramento-based California Dream in World TeamTennis rose 38 places in singles to No. 319 after reaching his second straight final on the U.S. Futures circuit. The 23-year-old American lost to Matija Pecotic of Croatia 6-2, 6-3 on hardcourts in the recent Winston-Salem (N.C.) Futures. Sandgren also improved eight notches in doubles to No. 224 by advancing to the final with former University of Tennessee teammate Rhyne Williams. They fell to Julio Peralta of Chile and Matt Seeberger of Los Altos 3-6, 6-3 [10-8]. Sandgren has been ranked as high as No. 183 in singles in 2013 and No. 115 in doubles early last year. He underwent hip surgery later in 2014 and missed more than six months. Sandgren is not named after tennis. He has Swedish heritage, and Tennys was his great-grandfather's name. Sandgren's ancestor did not play tennis. The Dream will begin its inaugural season on July 12 in San Diego and play its home opener the following night at 7:30 against Springfield at Sunrise Mall in Citrus Heights. Raquel Kops-Jones, a former Cal star who lives in San Jose, remained No. 14 in doubles after capturing the Nottingham title with regular partner Abigail Spears. They won Birmingham during the same week last year. Collin Altamirano, 19-year-old Sacramentan -- No. 990 in singles (-5). Bradley Klahn, 24-year-old former Stanford star -- No. 149 in doubles (+2), No. 239 in singles (+2). Scott Lipsky, 33-year-old former Stanford star -- No. 35 in doubles (no change). Mackenzie McDonald, 20-year-old Piedmont resident -- No. 555 in singles (-4), No. 565 in doubles (+6). Dennis Novikov, 21-year-old San Jose resident -- No. 192 in singles (+6), No. 195 in doubles (-1). Aisam-ul-Haq Qureshi, 35-year-old member of Sacramento-based California Dream in World Team Tennis (2015) -- No. 57 in doubles (-1). Sam Querrey, 27-year-old San Francisco native and former Sacramento Capital in World TeamTennis (2012-13) -- No. 38 in singles (+1), No. 58 in doubles (-1). Tennys Sandgren, 23-year-old member of California Dream -- No. 224 in doubles (+8), No. 319 in singles (+38). Matt Seeberger, 30-year-old Los Altos resident -- Career-high No. 204 in doubles (+35). Dmitry Tursunov, 32-year-old resident of Folsom in Sacramento area -- No. 650 in singles (-54), No. 585 in doubles (-72). Kristie Ahn, 23-year-old former Stanford star -- No. 342 in singles (-4), No. 611 in doubles (+2). CiCi Bellis, 16-year-old resident of Atherton in San Francisco Bay Area -- No. 170 in singles (-1). Alexandra Facey, 22-year-old resident of Cameron Park in Sacramento area -- No. 742 in doubles (-3). Kat Facey, 22-year-old resident of Cameron Park in Sacramento area -- No. 742 in doubles (-3). Jarmila Gajdosova, 28-year-old member of California Dream (2015) -- No. 60 in singles (-8), No. 73 in doubles (-4). Anabel Medina Garrigues, 32-year-old member of California Dream (2015) -- No. 36 (no change) in doubles. Nicole Gibbs, 22-year-old former Stanford star -- No. 102 in singles (-2). Michaela Gordon, 15-year-old resident of Saratoga in San Francisco Bay Area -- No. 707 in singles (+4). Lejla Hodzic, 29-year-old former Stanford standout -- No. 899 in doubles (-131). Raquel Kops-Jones, 32-year-old San Jose resident and former Cal star -- No. 14 in doubles (no change), No. 800 in singles (-3). Maria Sanchez, 25-year-old Modesto product -- No. 94 in doubles (+3), No. 169 in singles (+13). Allie Will, 24-year-old native of San Mateo in San Francisco Bay Area -- No. 225 in doubles (+6), No. 605 in singles (+3). Carol Zhao, 19-year-old Stanford sophomore -- No. 287 in singles (+5), No. 504 in doubles (-2). Birmingham (women), quarterfinals, 12:30-2:30 p.m. (delay). Halle (men), quarterfinals, 2:30-7 p.m. and 10:30 p.m.-midnight (delay). London (men), quarterfinals, 7-8 p.m. and 9-10:30 p.m. (delay). Birmingham (women), semifinals, 9:30 a.m.-1 p.m. (delay). Halle (men), semifinals, 3-7 p.m. (delay). London (men), semifinals, 7-8 p.m. (delay). SACRAMENTO -- Three years ago, CiCi Bellis of Atherton won the girls 18 singles title in the NorCal Junior Sectional Championships at only 13 years old. Bellis stood only 5-foot-3 1/2 (1.61 meters) and weighed just 85 pounds (38.6 kilograms) at the time. She has gone on to stun Australian Open women's runner-up Dominika Cibulkova in the first round of U.S. Open last August, end last year as the No. 1 junior in the world and climb to No. 170 in the women's world rankings as an amateur. Now, along comes an even smaller 13-year-old phenom from the San Francisco Bay Area. The appropriately named Katie Volynets, a Walnut Creek resident who's all of 5 feet (1.52 meters) and 80 pounds (36.3 kilograms), won the 16-and-under title today in the NorCal Girls' 18 & 16 Junior Sectional Championships at Arden Hills Resort & Spa. Seeded third, Volynets outlasted fourth-seeded Jillian Taggart of Fair Oaks in the Sacramento region 4-6, 6-2, 6-2 in the final on a day when the temperature reached 93 degrees (33.9 Celsius). Bellis and Volynets share more than their Sectional titles at an early age, small size and Bay Area residences. Both won USTA girls 12-and-under national hardcourt championships (although Bellis added the clay-court title in the same age group). Bellis was ranked fourth nationally in the 14s when she won the Sectionals; Volynets is sixth. Volynets' coach, Richard Tompkins, said he saw Bellis play at age 13. "I feel a little uncomfortable saying this because I'm friends with the Bellis family and I've known Lori (CiCi's mother) for over 20 years -- and I'm a little biased -- but Katie is better at 13 than CiCi was, in my opinion," Tompkins said on the telephone from Fremont. "CiCi at 13, even though she was winning a ridiculous amount of matches, was playing more of a counterpunch style and grinding players down. Between 13 and 15, those were huge development years for CiCi. She developed more weapons and (improved at) controlling points. "Katie's game is more developed than CiCi's was at 13. Katie is playing more aggressively off both sides. She's hitting the ball a little bit harder than CiCi was at 13, so she has better offensive skills than CiCi did at 13." Another precocious Tompkins disciple, 15-year-old Rachel Eason of Union City, captured the 18-and-under Sectional title. Eason dismantled talented but erratic Jenna Friedel, a 17-year-old Mill Valley resident, 6-1, 6-3 in the tournament featuring Northern California's best juniors. Tompkins lauded Volynets and Eason as "fierce competitors. I'd rather have a fiercely competitive athlete than an athlete who's talented but not as competitive. Competitiveness and a strong work ethic will take you really, really far. Both those girls are fierce competitors and work probably harder than any other kid in Northern California, and that's why they're both achieving the success that they are." Volynets, though, is anything but volatile on the court. She is amazingly mature, never getting too high or too low. There are pros who could learn from her businesslike approach. Volynets even works on her game between points, taking practice swings in slow motion to simulate perfect technique. "(Volynets) pushes herself so hard, whether it's in practice or tournaments. Even when she's exhausted, she'll continue to push and push and push. She has a will that just won't stop." Volynets has met Bellis, now listed at 5-foot-6 (1.68 meters) and a whopping 110 pounds (50 kilograms), once. "A couple of years ago, I was invited to her house, and we hit together," Volynets said. "We still keep in touch (by text) and have been trying to get together." Volynets' parents emigrated from Ukraine -- where her mother, Anna, was a top swimmer -- 19 years ago. Katie, an articulate eighth-grader-to-be at Walnut Creek Intermediate, said her goal in tennis is "to be a top professional. I need to continue focusing on tennis and school as much as possible, and then we'll see what's going to happen." All that Volynets seems to lack is size. "Is Katie going to have to grow between now and 17?" Tompkins said. "Of course, because unfortunately professional tennis has become such a power sport. The little guy is almost becoming extinct. "Katie doesn't have the luxury of having any weaknesses. She has to move faster than her competition, and she needs to become smarter than her competition. She has to develop her whole game. That's the approach right now, learning to hit every single shot out there and becoming one of the most intelligent players out there." So far, so good. When asked how she routinely beats older, bigger players, Volynets said, "A big factor is stepping inside the baseline whenever I get a shorter ball ... attacking it and making sure I place the balls." Taggart, 5-foot-8 (1.73 meters) at 14 years old, became so mentally drained in the final that she dropped the last six games of the match. "I got a little tired and lost my focus mentally," explained Taggart, who double-faulted meekly into the net on Volynets' first match point. "And she was steady the whole time, so congrats to her." It wasn't the heat that got to Taggart. It was Volynets. "She's probably the mentally toughest person here," Taggart asserted. "She doesn't give you any free points; you have to earn every point. You know it's going to be a battle." Taggart, ranked 14th nationally in the 14s, played with her left wrist taped because of an inflamed tendon that had sidelined her for six weeks. She admitted that the wrist hurt on her two-handed backhand but didn't want to use it an excuse. "It wasn't really a factor today," she said before going swimming with Volynets at Arden Hills, where Olympic multiple gold-medal swimmers Mark Spitz and Debbie Meyer trained in the late 1960s and early 1970s. Eason, 5-foot-7 (1.70 meters), has a strong first serve and dangerous flat forehand. Pinning Friedel to the baseline with deep shots and outsteadying her, Eason captured the biggest title of her life. She had lost in the Sectional 12- and 14-and-under singles finals but won the doubles crowns in those age groups. Winning the 18-and-under singles title "means a lot to me," Eason gushed. "It's the worst to lose in the finals because you're so close." Eason also avenged a 6-4, 6-3 loss to Friedel in last year's Sectional 16-and-under semifinals. Friedel went on to win the title. "I believed in myself more than I did last time, and I kept fighting and going for it," said Eason, who's ranked 81st nationally in her first year in the 16s. I've been playing better lately. "I guess I've been taking my mental skills more seriously -- after losing a point, calming myself down. Usually, I just get mad and it translates to the next point, and it keeps going from there." Friedel can relate. She was as emotional as Volynets was stoic, berating herself after her frequent misses, swatting one ball against the fence and, to pump herself up, yelling "C'mon" after winners. Friedel was so disappointed in her forehand that she held an impromptu practice session after the first set, dropping balls in front of her and hitting them to the other side of the court. After a USTA official told her she couldn't use match balls, Friedel ran over to her racket bag, pulled out a few practice balls and returned to the baseline for her self-taught clinic. "I didn't know what she was doing," marveled Eason, adding that she had never seen such a stunt during a match. "I know she's kind of fiery. I knew anything could happen, so I was kind of prepared for it." Eason will be a sophomore at James Logan High School. No home-schooling for her. "School is a good experience for you," she declared. "School to me is a lot more important. I take school more seriously than tennis." Said Tompkins: "One of the things I try to teach -- which probably only 10 percent of the students I coach are totally on board with, although they agree with the philosophy -- is you don't have to be a professional tennis player to do the things that pro tennis players do. "This is something that Rachel Eason and Katie Volynets have bought into. They practice and prepare just like a tennis professional. The only things that separate them are they don't hit the ball quite as accurately and they're not making money. But they take their tennis seriously." French Open awards: Stan, worst commercial, etc.